Thanks to the Nichols College Community for Making the WBZ NewsRadio “Talk the Vote” Event a Success! 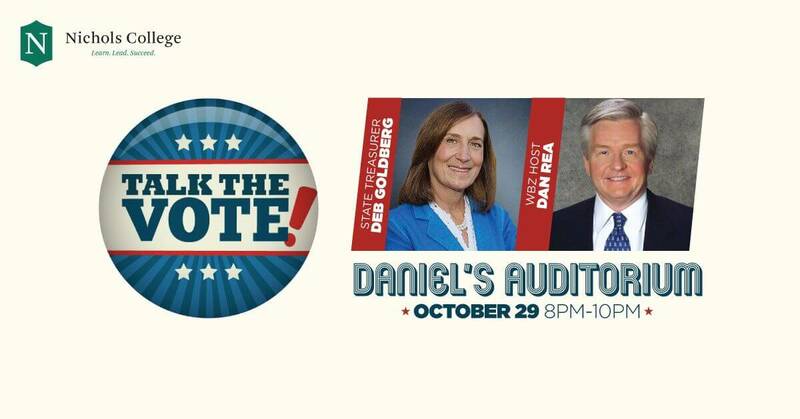 Over 200 students, faculty, staff, and members of the general public packed Daniels Auditorium Monday, Oct. 29, to participate in WBZ 1030 AM NewsRadio’s “Talk the Vote,” a live radio broadcast hosted by veteran journalist Dan Rea. The show — which was broadcast in 38 states and publicized Nichols College A LOT — featured Massachusetts State Treasurer Deborah Goldberg, Walpole Police Chief John Carmichael Jr., and Sira Natural CEO Michael Dundas. The audience was treated to an informative discussion about important matters facing the state. And that’s all due to a great group of Nichols community members. This fun, educational event could not have happened without the sponsorship of the offices of Marketing and Communications, Academic Affairs (Fischer Institute), Advancement, and Student Affairs (Student Government Association). As such, thanks to Bill Boffi, Dr. Mauri Pelto and Susan Wayman, Bill Pieczynski, and PJ Boggio. I’m especially grateful to Cathy for being our logistics guru, as well as to my faculty partner, Political Science Chair and Professor Erika Cornelius Smith. Academic Affairs, Advancement, Alumni, Campus Life, Editor's Letter, Events, Faculty, Fischer Institute, Newsroom, President, Staff, Students Dan Rea, election, elections, midterm election, NightSide with Dan Rea, political science, vote, voting, WBZ, WBZ NewsRadio. permalink.